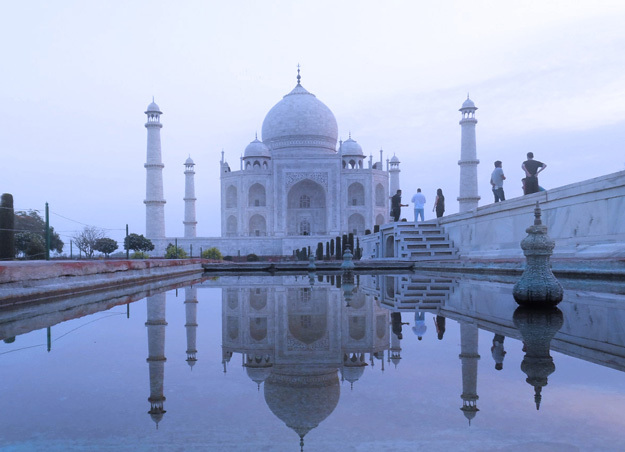 The Taj Mahal is just one of the many marvels you will find in India. Photos by Gina Michalopulos Kingsley. Visiting the Golden Triangle and Udaipur in India was the trip of a lifetime. 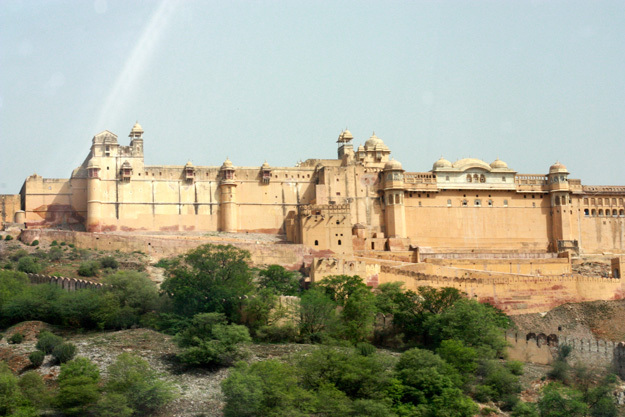 Dehli-Agra-Jaipur exposed us to temples, tombs, forts, mass humanity and culture. In Old Dehli, you’ll find both mass humanity and interesting architecture. Jama Masjid is the largest mosque in India and the last architectural magnificence of Shah Jahan. We drove past the Red Fort and then saw the Qutub Minar, a high tower dating back to 13th century Islamic culture. Next was the India Gate and the President’s House: Rashtrapati Bhawan. Completed in 1929, the palatial building is a blend of Mughal and western architecture. Agra was the second day of our sightseeing. We woke up at 4:00 a.m. to catch the 5:30 a.m. sunrise at the Taj Mahal. This mausoleum of Empress Mumtaz Mahal, the beloved spouse of Shah Jahan, is everything you think it will be, and more. Depending on the light of day, the white marble takes on different tones. From a distance, you see an all-white or opalescent tone but as you get closer, you notice the jewel inlay. The groom performs during the Sangeet. 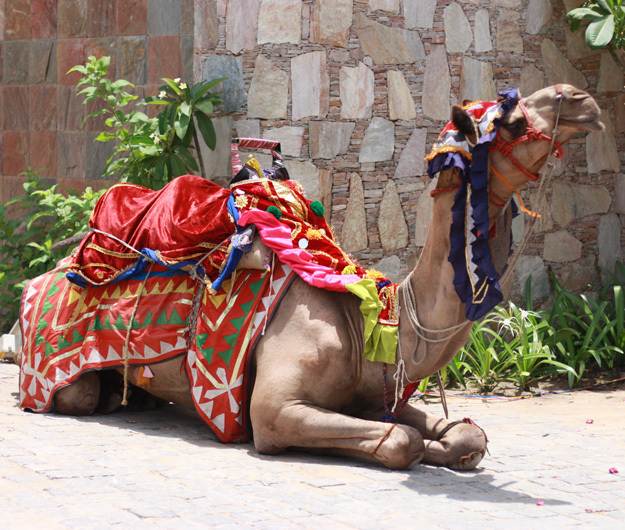 Camel decorated in traditional indian garments. 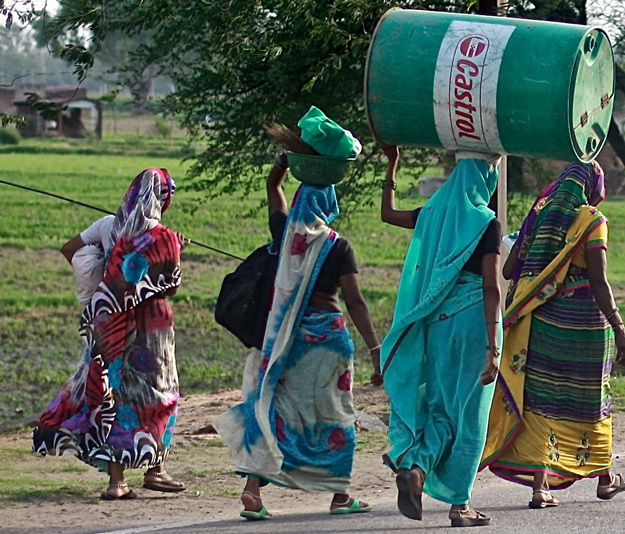 The colors of India are vibrant. Driving down the streets, we saw cows, monkeys, boars, camel carts and more. Monkeys climbed along the roofs of buildings and forts and one even jumped on our tour van. Jaipur was our next stop on the Golden Triangle and a personal favorite. We saw the Amber Fort, City Palace and Jantar Mantar Observatory. 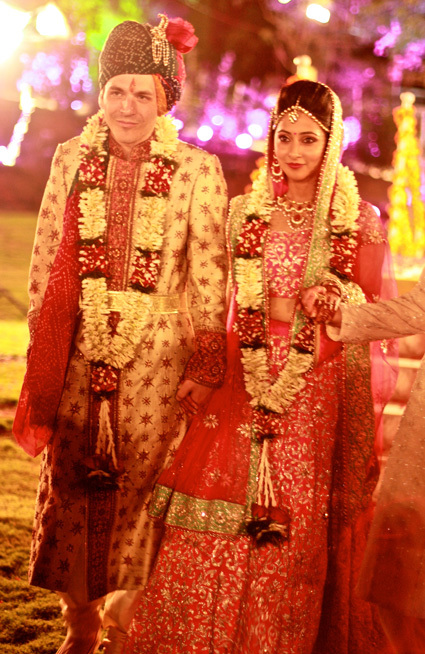 Being part of a wedding in India was an incomparable experience of love and traditions. The wedding events in India eclipsed the sightseeing for me. Three straight days of wedding extravaganza will be an indelible memory for us. The events included: Haldi, Mehndi, Sangeet, and Baraat. At the Haldi, the bride and groom were polished with turmeric paste. 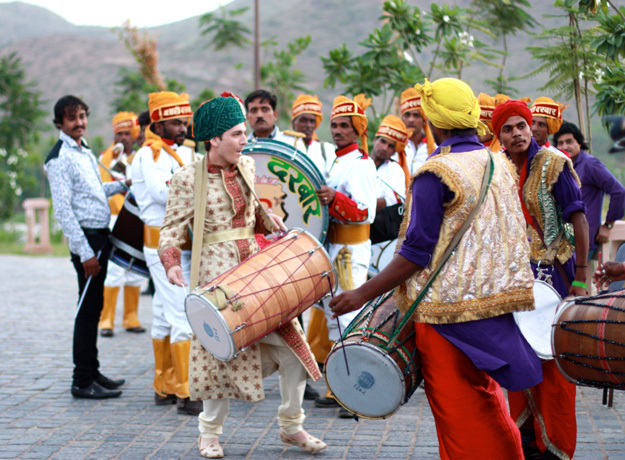 The Sangeet featured traditional dances presented to the bride and groom by groups of family and friends. We presented our choreographed dance on an amphitheater stage with lasers and lights. The symbolism of the two dances performed by the groom’s family intrigued me. The dances conveyed feelings of happiness and joy and had many hand movements and drumbeats. The bride sent us videos of the dances to learn beforehand. Bride and groom are elegantly dressed as they meet for the Baraat. Bride is covered in tumeric paste during the Haldi ceremony. The Baraat is the bridegroom’s wedding procession (on an elephant or horse) accompanied by bands, dancers and fireworks as it reaches the meeting point between the two families. The bride’s favorite ritual was the Mehndi, riding in on the rickshaw. The groom, who is not Indian, shared that he felt like the center of everything in a grand entrance. His in-laws welcomed him and admired that he learned a little bit of Hindi and dancing. The bride and groom were unaware of some of the details that celebrated them with a bang – literally – as fireworks and rose petals shot out of a tube during the bride’s procession to meet the groom.